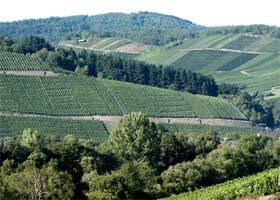 Internationally acclaimed as one of the best vineyard locations of the Moselle. The extremely steep slopes run parallel to the river and face due south. The location also benefits from currents that transport air warmed by the Moselle into the vineyards. 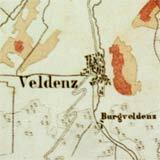 The Veldenzer Kirchberg lies in a tributary valley of the Moselle. The vineyards face south-southwest on blue slate subsoil and produce wines similar to those of the Saar and Ruwer since they tend to contain a little more acid than the wines from vineyards which lie directly on the Modelle. Our oldest vines are to be found here with an average age of more than 35 years. Indeed, some vines are more than 80 years old. The Carlsberg is the heart of the Veldenzer Kirchberg. 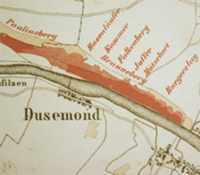 In spite of changes in the wine legislation dating from 1970, it was possible to maintain one of the smallest individually named vineyard locations in the Moselle region. About 1850, Louis Richter built an outhouse on his vineyard that can still be visited to this day. Walls were also built around the vineyards to reduce air movement at ground level producing a favourable microclimate. The vineyards in Sonnenlay are a geographically rarity in the Moselle valley. Within recent geological history, the course of the river Moselle has changed several times. The hill called "Sonnenlay" lay within an incised meander of the Moselle which was at some point cut off leaving a hill which has been planted on both sides. Vineyards were planted below the ruined castle of "Landshut" which later were given the name "Schlossberg" ( = castle-hill ). The location stretches from the castle itself all the way to the suburb of Bernkastel-Kues called Andel. The vines are interrupted in several places by steep rocky outcrops. 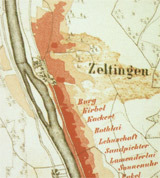 The largest of the vineyard locations belonging to Zeltingen has slopes that range from steep to nearly vertical. The soil is particularly stoney which gives the wine an enhanced minerality and also an incomparable, refined elegance.